​be sustainable & resilient in the Anthropocene? At LUFA, we work with nonprofits, municipalities, and community groups within the urban forestry and urban greening community to conduct applied research that aims to improve capacity to steward our urban forests and greenspaces now and into the future. Our lab's mixed methods projects are heavily influenced by transdisciplinary systems thinking, the social-ecological system (SES) framework, the discipline of sustainability science, and theories of transformative leadership and ​changemaking. Though our research is based primarily in North America, we are inspired by the work of the many people and organizations working to improve life for urban communities around the world. Students in ENV 341 in Spring 2016 learning from Chicago DOT Urban Forester Jeff Brink how the City of Chicago plants trees in the Loop. The skyline of Atlanta, Georgia, one of the most sprawling metros in the U.S.
Because of these and other changes in our environment, in the Anthropocene, human societies will have to work harder to meet our basic needs and make life comfortable for all living things on the planet. The Anthropocene is predominately urban: over 50% of the global population and 80% of the developed world live in urban areas. 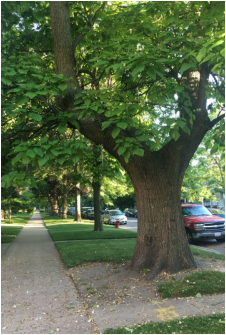 Urban forests provide many benefits that contribute to a high quality of life for urban residents, and can help communities mitigate and adapt to the stresses of the Anthropocene. Trees store carbon, mitigating atmospheric carbon dioxide; manage stormwater flows, helping cities adapt to increased storm frequency and magnitude; and moderate the urban heat island effect and help cities cope with extreme heat events. Urban forests are also connected to human health and wellbeing by improving air quality; decreasing incidence of cardiovascular disease and obesity, and improving concentration and overall mental health. Urban forests and urban greening activities also provide crucial social benefits, like creating settings that promote neighborhood interaction and cohesion and building neighborhood capacity for collective action. ​All of these benefits can reduce the vulnerability of people and neighborhoods to the stressors of the Anthropocene. Learn more about who we are and what we do at LUFA using the links below or the menu bar above.